Dave donated 3 grocery bags of clothing he no longer wanted and trashed a few items that were definitely past their prime. I gave a small bag of clothes to my sister, donated 2 grocery bags stuffed full, and have 3 larger bags of stuff to bring to a consignment store (yes, I will donate anything that doesn’t sell). All together, that means 9 stuffed-full bags of clothing left our closet and dressers last week AND we transferred all our shoes to the new mudroom. Boy, does our closet feel clutter-free! 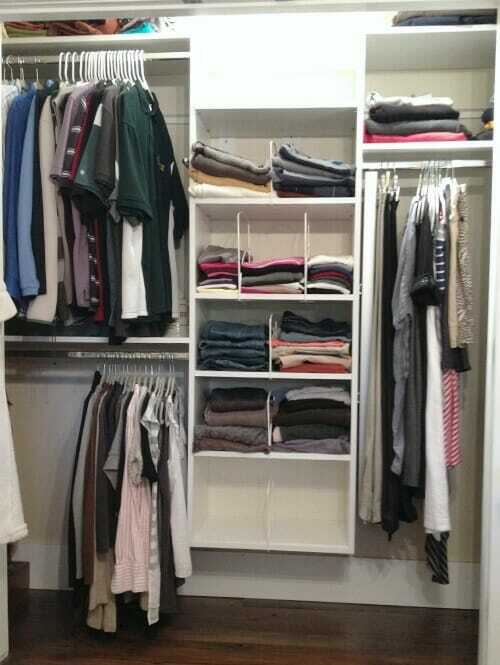 Here’s a break-down of the closet’s layout. We now have 2 totally empty shelves, a mostly empty top shelf (you can’t see it in the pictures) and a completely empty floor. In case you forgot, THIS is what our closet looked like back in May (before I returned all my borrowed maternity clothes). SO MUCH STUFF!! Not only did I return (and remove) all my maternity clothes, I also quickly purged anything I knew I wouldn’t wear even after I lost my baby weight. I ended up with a much more organized closet (see photo below) — but I still felt like I was hanging onto clothes I rarely wore… not to mention all the clothing I never really loved or felt super comfortable wearing. Plus Dave never went through his stuff. So since I’m always harping on you guys to purge anything you don’t need, use, want, or love, I finally decided that enough was enough and I simply HAD to pare my closet down to the absolute bare necessities. AHHHH — room to breathe! I did not do this to prove anything to myself or to anyone else. I did it because it was taking me FOREVER to decide what to wear every day, I felt like I hated everything in my closet, and I ended up wearing the same few pieces over and over again. what is your favorite type of clothing to wear? what is your favorite shirt, pants, sweater, etc.? 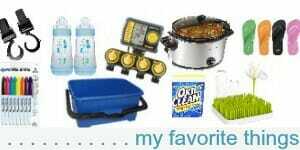 why do you think you like those particular items? what do you like about your body and want to accentuate? what would you prefer to cover up? what do you wear around the house? when you go out? to church? to the grocery store? And after only a few minutes of thinking through these questions, I was already starting to realize why I wasn’t wearing SO many of my clothes. I realized that I wear jeans, jean shorts, or black yoga pants almost 100% of the time. So if a shirt doesn’t look good with jeans or jean shorts, I shouldn’t buy it. This realization liberated me to purge all my other non-jean pants (besides 2 pairs of dress pants for church) and almost all my shirts that didn’t look great with jeans. I realized I almost only wear cotton or a cotton/spandex mix because I CANNOT stand any non-stretchy, non-breathable fabrics. So again, I felt free to purge anything in my wardrobe that wasn’t cotton or spandex. I realized that although I used to wear sun dresses and cute skirts all the time in the spring and summer, I no longer wear them now that I’m chasing kids around all day. I only needed to keep a couple dresses and skirts. I realized that I often wear the same things over and over again, and I’m OK with that. I stay home most days and do laundry regularly so this works for me — and it means that only having 10-12 nice shirts is plenty for me. I realized I actually had quite of a few nice items of clothing and really only needed some select pieces to tie everything together and make my old stuff seem new and fresh again. I realized that I was hanging on to so many unloved pieces of clothing because I felt I couldn’t get by with less. I realized that my body shape is different than it was even 2 years ago and my clothes aren’t going to fit me the same way. It’s OK to purge items that are still nice, new, and that I used to love just because I don’t feel great in them anymore. This might all sound overly detailed and overly obvious to many of you. Yes, I did know most of this before; however, it wasn’t until I had someone in my bedroom going through my closet with me that I actually put it all together and realized there was no point cluttering up my closet with anything I didn’t love or feel fabulous wearing. It felt SO great to purge my closet of everything I didn’t love and everything I didn’t feel great wearing. Since meeting with the personal stylist last week and purging much of my closet, I’ve done a little online shopping and purchased a few new items (all from ThredUp.com) that are on their way to my house right now. I”m armed with a VERY short list of a few specific items I need/want to add to my closet — and I know I don’t need anything more. I’ll be sharing more about working with the stylist (as well as my new outfits) in a future post. But I’m just so excited about getting my closet pared down that I just had to share! 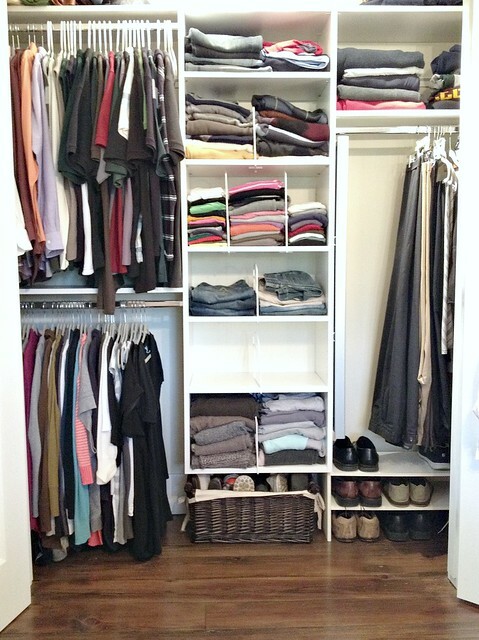 I know many of you have contacted me over the years asking about tips and tricks to organize your closet. For me, I think it always comes back to really asking yourself what you LOVE to wear and feel great in. Those are the pieces you’re going to wear — and you probably won’t miss everything else! So the next time you start to weed through your clothing, ask yourself some of the questions above… and more importantly, ask yourself what clothes you LOVE to wear and what clothes you feel great wearing. If you honestly answer those questions, you should have no trouble purging much of the rest. When I try on clothes out of my closet. I ask myself if I would feel humiliated if someone very important saw me wearing it. That one question helps me to purge. 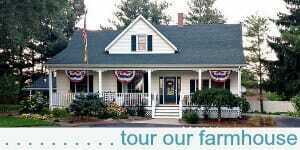 I just want to commend you on how detail, very practical living advises you give on your site. It’s all real, simple, true & easy to follow. You have beautiful kids & family. God bless you & your fam. Hey Lori — I LOVE ThredUp! It is a little overwhelming with so many selections, but it’s also really easy to narrow it down by exactly what you’re looking for. I simply use the various search tools in the left side bar. I choose my size, the type of clothing I’m looking for (tops), then the sub category (long sleeve tops). I always search for “low price to high price” so the cheapest items show up first… and sometimes I’ll even choose specific brands or colors if I’m looking for something very specific. I’ve found some amazing bargains on awesome used clothing. Hope you do too! Thanks for your quick response! One more question…Are there any specific brands you have found to be more durable, consistent quality,better made than others at ThredUp? Things are made so much cheaper now, I wondered if there are specific brands you tend to prefer when searching the site? Wow! 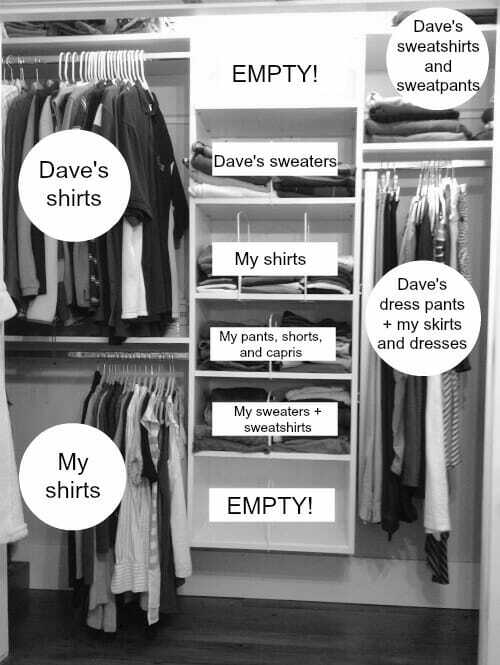 I did something similar very recently to my closet and it was seriously the most liberating feeling ever! I got rid of about 2/3 of my clothes. I realized I was holding onto things that were 3-5 years old but because i spent a lot of money on them I felt terrible giving them away. So inwould make up an excuse to keep them trying to convince myself that i will wear it. I am similar in nature, i tend to wear the same clothes over and over . I have my favorites too (especially after a baby) which are mainly leggins and well I was only able to find one pair of jeans since i had my daughter that I felt comfortable wearing. I will be following to see what your wardrobe will look like. I really want to do all my clothes shopping online but i am afraid to buy stuff without trying it on. How do you go about that? Oh wow, I feel liberated just reading this! 🙂 It’s like a light bulb suddenly went on in my head when you said you were free to purge anything that didn’t go with jeans/short/yoga pants. I’ve been frustrated with my inability to keep a semi-minimal, versatile wardrobe for so long, this is making me think that I need to pick one type of item (like pants or skirts) and build the rest (blouses/accessories) around it. Hmmmm….. Thanks Elise! It was kind of a “lightbulb moment” for me too! Just curious where you found your personal stylist. I don’t live in MI, but I’d love to have someone help me with my wardrobe. that has to feel so great! good for you, and I’m eager to see what new things you bought! Great post! I’m currently struggling with a huge wardrobe – after a pregnancy and some health issues, I think my wardrobe spans about 5 sizes! Just grabbed a trash bag to start on my closet. Thank you for your inspiring writing! I LOVE seeing the empty shelves! It must be an amazing feeling to get all of those bags of stuff you don’t use out of the house. Yes Kate — it feels great! I just wrote a post about clearing the clutter. After seeing your post I realize I HAVE A LOT of work ahead of me. Honesty is the best policy. Your post is inspiring, thanks. Purged a huge garbage bag full of stuff from my closet today and am all geared up to go through the boys’ things tomorrow. Thanks for the inspiration! I love your posts about your minimalist wardrobe. I have been purging quite a bit lately but need to streamline it even more. Those are great questions to ask yourself as you are going through the process! Thanks so much and God bless!!!! 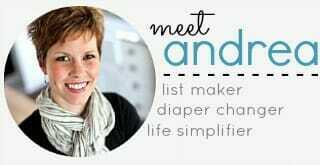 I love this post because I struggle from being stressed with the amount of clutter that I have, yet, because of our income lately, I also fear purging too much in the event I may need it some day and not be able to replace it if I get rid of it. However, I am realizing that if I never wear things and don’t even like them, they probably need to go. Thank you for being such an encouragement to us. Your closet looks great! Once saw that someone asked themselves, if they saw each item of clothing in the store (and didn’t already own it) would they buy it.. Good question…. Great post! I hope you include links for your new clothes or tell us where you purchased them. I also found a lot of local sites on FB for selling items (similar to craigslist, but much quicker) and a FB site that gives things away for free (similar to freecycle, but there’s always places to donate as well). This is a great time of year to get rid of clothes with “back-to-school” and the changing season. Please tell us where you purchased those shelf dividers…. Great post! All of the clothes I own wouldn’t even fill up nine bags–just not worth my storage space. I really enjoyed the wardrobe questions too–great reminders to make smart choices. Thanks Dawn — and just to clarify, the 9 grocery bags were for both Dave and I from our close and our dresser (Dave purged a ton of T-shirts), and they were the smaller plastic grocery bags (not trash bags). Anyway, it does feel great to have all that extra weight out of our bedroom! Thank you for the ideas/self-questions on how to start purging. I have a lot of clothes too that I feel I should keep. My business suits are still around just in case my current work requires it one day, or God forbid I have to go for a future job interview, or start working for a company that requires professional dress code. I have evening wear that are worn once or twice a year that I switch wearing just so people don’t remember I wore it last year. Then living in an area with 4 seasons I have a variety of clothing for each season. These are my reasons for having difficulty purging. I would get rid of maybe 6 shirts but never to the extent that you have. I think I still will have a hard time but will continue to try. Hi Debbie, I totally understand where you are coming from — but I truly do think that if you honestly answer some of the questions in this post, you could enjoy a much less clutter closet. We live in Michigan so we also have 4 seasons of clothing (all in our one closet) and we have dressy clothing for church, weddings, etc. Debbie….I can totally relate to your practicality and sentimentality regarding business wear….After I retired, I kept beautiful business suits and career-wear (most were Christmas and birthday gifts from my husband and I, too, had happy work-related memories of the clothing) thinking that I would wear them for church or other events or if I had to re-enter the workforce unexpectedly…..after 2-3 years of not touching them, I finally let go and donated all to an organization that helps women and children – knowing how much they would help someone who really needed outfits to interview and wear to work right now! My motive was to free up space and simply move on, but also I realized that, despite some outfits being timeless, styles change, materials change, the workplace has changed… Consider keeping just a couple of classic outfits in case your situation changes to where you need that style of clothing….and then update with new when it is necessary and you are able to. A new career experience is a fresh start after all….and you will hold your good memories in your heart forever! Janis, thank you for the advice. It makes sense what you shared. Will start purging away. Debbie — I’m not the person to ask about “sentimental” anything, because I would say “get rid of it”. I’ve seen WAY too many people holding on to WAY too much sentimental stuff over the years. I see how much stress those sentimental things cause them, so I’ve vowed not to hold onto clutter simply for sentimental reasons. Your clothing does not hold any memories — the memories will be there with or without the clothes. To me, it sounds like these work clothes definitely need to go. If you happen to get another job where you absolutely must where a suit, I’m certain you’ll be able to find a deal on another one. In the mean time, you’ll enjoy all that extra closet space and probably help a bunch of others who need business clothing right now. Thanks Andrea. Ya I know I’m a weird one for attaching memories to clothing. Glad to be reminded memories will be there even if they’re gone. Janis’ experience helps to remind me too that by getting rid of most of them it would help others in need. I love this post! Lately I’ve been purging my clothes slowly but surely. I’ve held onto them for so long because I’ve felt so much guilt for buying these clothes in the first place. Most of them are brand new with tags, all bought very cheaply since I’m a huge sales shopper. But still cluttering my mind and physical space. So I’m posting them all to ebay. It’s been quite a process, and I know I should just get rid of them and be free. But as a stay-at-home mom right now, it is a way for me to make back the money that I put into the clothes and to be free of all the guilt. I have about one hundred (YES!! I know, it’s ridiculous!) items posted now, and I have more piles to post and I have more to go through. 1) Do you keep wool clothing stored somewhere else besides your closet to protect from moths? Or are all your winter clothes pictured, too? 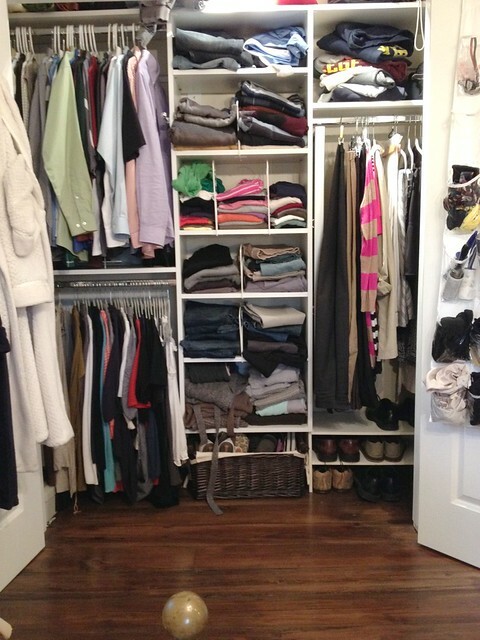 I have one bin under my bed with winter items and I’d love to incorporate it into my closet. 2) Do you have any dressers in your bedroom? Or are all your clothes in your closet? I have two dressers and I would love to ultimately get everything into my closet. Or maybe get a small dresser for my closet for pajamas, underwear, etc. I just love the thought of a really minimal room. wow, sounds like you’ve really been in “purge mode” lately! I think it’s great that you’re selling things on Ebay, however I would strongly encourage you to allow yourself to simply pack everything up and donate it if you ever start to feel overwhelmed by the whole selling process (or if things aren’t selling). I realize you have some quilt, but until you fully remove all those items from your home, the guilt will always be there, staring right at you. 1. Nope, ALL our clothing is in our closet and we’ve never once had a problem with moths or bugs. 2. Yes, we have dressers for socks, underwear, pajamas, and “grubby clothes” we wear for working outside, painting, house projects, etc. I love the look of our shabby dressers in our bedroom, so I would leave them there even if they were empty 🙂 However, if you like the minimalist look — that’s definitely something to work towards are you declutter. I loved all those questions!! for my 44th birthday…I gave myself the gift of style and a planned wardrobe…. I got rid of all the mom frumpy wear and bought shirts and jeans that were stylish, affordable (kids can ruin our clothes)! and could be worn a variety of ways… I’ve pretty much finished shopping for the basics– except for a great bag…. and am now just browsing accessories or pops of color and a “pulled together look…. I gave myself the base colors of navy and gray and went from there! can’t wait to see pics of the outfits you have! have you heard the concept of a capsule wardrobe? I love it!! That sounds great! I’ve never heard of a capsule wardrobe — but I think I can imagine what it might be! At this point, I can’t go too crazy buying new clothes because we are planning to have more children at some point… so I don’t want to buy an entirely new wardrobe only to get pregnant again… but just starting the process by purging, consolidating, and adding select pieces to my current wardrobe feels amazing! I can’t believe this is your post for today! I was lying in bed thinking about packing for a beach vacation we’re going on soon. The thought of going through my clothes was stressing me out completely! I own way too many items of clothing. I’m going to go through my closet when I’m done typing this because you’ve made me realize I can purge so much unused stuff! Off the top of my head I know I have at least 3 different fleece jackets, but I really one wear one of them. Thanks for the inspiration, I can’t wait to get started! happy purging Michele — and have a nice vacation too!